Here is a look at the original VA 12 from a geographical standpoint using current route numbers as a guide. VA 12 originally began at VA 10 (now US 11) Cedarville, then headed southeast over today's SR 803 to south of Lodi, then down SR 803 SPUR (an old VA 91 alignment), then south down VA 91 to Damascus. The 1923 Official shows VA 12 following today's US 58 east a short distance, then following Orchard Hill Rd across Laurel Creek, which connects with VA 91 east of town. The 1923 Official shows VA 12 running along today's SR 725 to Taylor's Valley, then SR 726 to US 58 to Green Cove. This requires a dip into Tennessee to accomplish between Damascus and Taylors Valley. In Grayson County VA 12 appears to have followed US 58 to near Rugby, then SR 725 southeast to SR 856 (old VA 16), requiring a brief dip into North Carolina. Then it followed VA 16 back to US 58. There is a small chance it used SRs 725-743-723-722-721 to US 58. In any case, the '23 Official clearly shows VA 12 not following Wilson Creek to Volney. VA 12 pretty much follwed US 58 from Mouth of Wilson to Independence. In 1924, VA 12's west end was moved to VA 10 (still US 11) Scotts Addition near Abingdon, then followed US 58 to Damascus except used Minton Ln near Osceola; Drowning Ford Rd near Delmar; Blossom/Hollyfield Rds. through Roetown and Valis Mill. VA 12 then followed VA 91 north to Lodi (use Librty Hall Dr loop), then east on SR 762 to St. Clair Bottom (replaced parts of CRs 4 and 2), then SR 660 to SR 650 which VA 12 followed south to Holston Mill and continued on SR 650 all the way to VA 16 (replaced CR 4). VA 12 then followed VA 16 through Troutdale and probably used SRs 836-739 and SR 737 through the Grants area, then followed VA 16 down to Mouth of Wilson. In July 1933, VA 12 was renumbered as US 58 from Abingdon to Independence. VA 12 followed US 58-221 east to VA 274, then east on 274 to SR 691 which it followed north partway to SR 692, then east back to VA 274 over what is no longer a road. VA 12 then followed VA 274 to VA 94 south to SR 640 which used to ferry the New River. VA 12 continued on 640 through Old Town to Galax as Greenville Rd, then W. Stuart Dr (makes a 90 degree turn at MacArthur) back to US 58-221 to Glendale Rd out of Galax and on SR 887 out to near Woodlawn before using Woodlawn Rd and again US 58-221. If VA 12 ever used SR 722 Gladeville Rd it was before 1923. It appears VA 12 initially followed SR 707-701-958-957-714 to go from Browns Store to Hillsville on what was then called the Grayson and Carroll Pike (today this is Training Center Rd; Whits End; break in route where I-77 is; Shotgun Trail and the E-W part of Old Galax Pike. This turns into W. Grayson St, crosses US 52 onto E. Grayson St which used to seamlessly become today's US 58 again at the US 221 split. VA 12 east of Hillsville followed US 58 for the most part except Retrievers Run/Shatner Rd near Crooked Oak. After crossing Reed Island Creek it appears VA 12 followed SRs 654-652-630 to get to Floyd County. VA 12 headed southeast back to today's US 58 using SR 781 which used to connect to SR 780. VA 12 followed US 58 into Patrick County, where it then used US 58 Business into Meadows of Dan. VA 12 may have used SR 795 Concorde Rd. VA 12 appears to have followed the US 58 descent off the Blue Ridge until near the bottom where it used Greasy Bend Ln. VA 12 followed today's US 58 and 58 Business into Stuart. East of Stuart, VA 12 followed SR 765 Rhody Creek Loop; US 58; Campbell Farm Loop; US 58; SR 777; US 58; SR 625 Mt. View Loop; US 58; SR 657/827 S. Fork Loop; US 58; SR 700 through Netteridge; SR 832 Golf Course Rd through Trent Store; SR 701/854 Stella Loop to Penns Store. VA 12 crossing of Henry River In Henry County, VA 12 began using SR 969 Turnpike Rd/Mayo Landing Rd to Craig; Maple Leaf Rd; SR 695 Spencer Penn Rd to Spencer; US 58; SR 759 Evergreen Dr; US 58; Arrowhead Circle; US 58 and 58 Business essentially from Horsepasture to US 220 Business (which back then as VA 33 ran just east of the overpasses). VA 12 followed US 58 Business into eastern Martinsville. 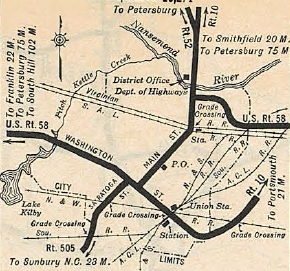 It is hard to tell but I think in the mid-20s VA 12 used a straighter alignment from Reed Island Creek to the Floyd line using SR 813; US 58; SR 646; US 58 and SR 632. The old convoluted routing north of this became CR 123, 285A and 278A in Carroll Co and CR 205 in Floyd. In 1925 or 1926, VA 12 was given a paved, straighter alignment from Browns Store to Hillsville along today's US 58-221. This left behind CR 104. 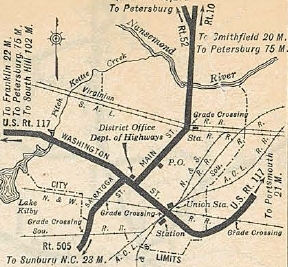 In 1927, VA 12 was rerouted to cross the New River via today's VA 94 bridge and then following SR 882 east to W. Stuart Dr. The old routing was downgraded to CR 291A west of the ferry and CR 12 east of it. Also in 1927, VA 12 stopped using Turnpike Rd in western Henry County and began using today's SR 630. Turnpike Rd became CR 250. 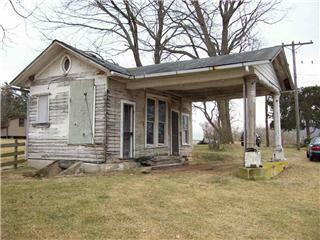 In 1928 or 1929, VA 12 was taken off Starling Ave in Martinsville and placed on Broad St north, then Church St east. In 1930, US 221 was attached to VA 12 from Independence to Hillsville. 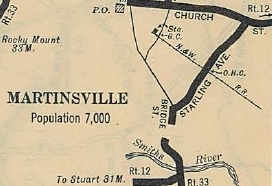 In 1932, US 58 was attached to VA 12 from Hillsville to Martinsville. In 1932 (bridge date), VA 12 bypassed Woodlawn in Carroll County. It is hard to tell using maps, but by 1932, VA 12 was using today's US 58 instead of Old Danville Pike to cross from Carroll to Floyd, leaving behind CR 273A. Also it was straightened out in eastern Carroll County to today's 58 leaving a few CR loops. In July 1933, the entirety of the Hillsville to Martinsville dropped the VA 12 designation in favor of US 58. Martinsville to Halifax: VA 12 headed out Church St east to Brookdale St then southeast on that to Spruce St which becomes SR 650. VA 12 followed this to SR 620 Old Liberty Dr, then east on SR 620 through Chatmoss to Burnt Chimneys and Axton before entering Pittsylvania County. VA 12 used US 58 east of SR 620, then followed SR 855-854-622 to West Fork; US 58; SR 708; then US 58 through Brosville. 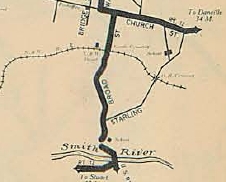 VA 12 followed VA 51 in its entirety into Danville, then along US 58 Business to Union St, then across the Dan River to VA 413 Memorial Dr which VA 12 followed to N. Union St which led to Main St. VA 12 crossed the Dan River again onto N. Main St and followed Bradley St east to Justin Ln. which now ends at the RR. On the other side it picks up as "Old Hwy 360" whose connection back to VA 360 is broken by US 29 Bypass. Once past the bypass VA 12 rejoins VA 360 which it follows through Keeling and Vernon Hill before reaching Halifax. In late 1931 or so, VA 12 was rerouted to modern US 58 Business and US 58 from Martinsville to VA 51. This left behind Henry CR 1 and Pittsylvania CRs 264A, 283A, 267A and 268A. Also in late 1931, in Danville VA 12 was removed from Bradley Rd and instead placed on VA 360 to Justin Ln. In 1932, US 58 was assigned to all of the Martinsville to Danville section. In July 1933, VA 12 was dropped from the US 58 segment, while Danville to Halifax was renumbered as US 360. Initially, VA 12 followed VA 360 to Ferry Trail; Archer Trail; Marion's Trail; Bagwell Dr-Wagstaff Rd-Wagstaff Ln (the trails no longer connect to one another), then pick VA 360 back up. VA 12 follwed VA 360 to US 360, then US 360 to VA 92 which VA 12 followed to Clover. VA 12 then followed SR 716 and SR 715 east out of Clover to use Mosley's Ferry across the Roanoke River into Charlotte County. It appears VA 12 resumed on SR 705 in Charlotte County over to VA 92, then east on VA 92 to Kings Crossroads, then south on SR 631 which after a short jog on US 15 continues east back to VA 92. VA 12 followed VA 92 briefly but used the intertwined SR 600 into Chase City as 5th St. VA 12 followed VA 47-49 to VA 92 then followed VA 92 to Boydton. In Boydton, VA 12 picked up US 58 Business east to about the mainline US 58. VA 12 initially followed a road now abandoned save a small piece of SR 608 Ridge Rd that follwed the RR tracks closely (north side) until about the current US 58-VA 4 jct. VA 12 followed "Old Plank Rd" from here which is now SR 674 to Baskerville; SR 669 to SR 668 to SR 663 to SR 645 to SR 644 to SR 661 Lombardy Grove; SR 661 to South Hill. In late 1926, US 501 was assigned to VA 12 from Halifax to the Red Oak area and US 401 was assigned from Boydton to South Hill. In early 1927, VA 12 was moved off SR 661 Old Plank Road onto today's US 1 into South Hill, leaving behind CR 212. VA 12 crossing of Roanoke River In 1930, VA 12 was put on today's VA 92 from Clover to Chase City (using 2nd St, as is the case still). This left behind Charlotte CR 114 and 110; Mecklenburg CR 280. Also, about 1930, VA 12 was placed on brand new alignment (today's US 58) from Boydton to US 1 Normandy Grove. This left behind several CRs: 223A, 262, 205A, 8, 130, 5, 105, and 12. 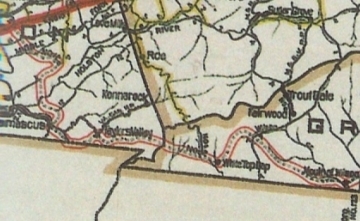 VA 12 using "Plank Rd"
In 1931, VA 12 (with US 501) was straightened out east of Halifax onto the current VA 360 alignment, leaving behind all those "trails" as CR 15 and 120. In 1932, the US 401 designation along VA 12 was renumbered as US 58. In July 1933, VA 12 was renumbered as US 360 from Halifax to the Red Oak area; VA 46 to Boydton; remained US 58 to South Hill. VA 12 followed US 58 east past I-85 then followed High St to La Crosse. VA 12 cut north on SR 618 Main St, then east on PIne St out of La Crosse. VA 12 followed US 58 a little, then Watkins Rd/Lambert Ln to the Broadnax area. VA 12 continued along US 58 to SR 623 except it used Jones Circle Rd. VA 12 followed SR 623 to Diamond Grove, then SR 644 back to US 58 which VA 12 followed into Lawrenceville via US 58 Business (best as I can tell). East of Lawrenceville, VA 12 followed SR 606 to Edgerton, Totaro and into Greensville County. VA 12 then followed SR 607 through Radium and Kingsbury before meeting back up with US 58 near I-95. VA 12 used Westend Dr right at I-95's crossing, then current US 58 Business through Emporia until Halifax St (just past US 301). VA 12 cut south on Halifax St then east on Valley St/Southampton St back to 58 Business. VA 12 followed US 58 into Southampton County but veered south on SR 615 which loops back to US 58 after a while. After a brief turn on today's US 58, VA 12 followed SR 654 through Dreweryville, Worrell, and Pope before coming back to today's US 58. VA 12 did NOT use the piece of 654 that runs from Pope directly to Courtland unless it was in 1918-19. Instead it followed US 58 and 58 Business through Courtland. VA 12 followed US 58 and 58 Business into Franklin, then used Clay St, 4th Ave, Main St and 2nd Ave (not 58 Bus' route now) to head east. VA 12 followed US 58 Business to Carrsville and Holland, then US 58 a few miles, then US 58 Business and then VA 337 to downtown Suffolk. In 1926, VA 12 was moved to today's SR 750 and US 58 from east of Lawrenceville to Edgerton, leaving behind CR 12. In late 1926, US 117 was assigned to VA 12 from Franklin to Suffolk. About 1929, VA 12 was given US 58's current routing between ECL Emporia and Pope, leaving behind CRs 137 and 136. In late 1931, VA 12 was put on today's US 58 alignment from Edgerton to Emporia, leaving behind more CR 12 and Greensville CR 123. In 1932, US 58 was assigned to VA 12 from South Hill to Franklin and replaced US 117 from Franklin to Suffolk. In July 1933, this entire segment of VA 12 became just US 58. VA 10-VA 12 followed VA 337 from Suffolk to Driver, then to Portsmouth along what was then called Suffolk Rd (current VA 337 ALT) to 6th St to High St. The route followed High St towards the ferry to Norfolk. Then the route did a zig-zag using 1st St, London St, then Water St south to Queen St east to the ferry. Once in Norfolk, the route picked up Bank St over to Princess Anne Rd over to Battery Rd (this is just east of Park Ave and may not exist now) and then to Broad Creek Rd (this is Virginia Beach Blvd). The route followed Virginia Beach Blvd to Witchduck Rd. Then two possibilities existed - current Va Beach Blvd east to Happy Rd to Bonney to Rosemont OR it used Euclid, Alicia, Baxter and Bonney Rds (broken up by I-264 today) to get to Rosemont. The route ran northeast of today's US 58 on destroyed routing to use either Alcott or Edinburgh Dr to get over to Lynnhaven Rd. The route used Lynnhaven Rd southeast to Lynnhaven, then ran through today's I-264/Lynnhaven Pkwy interchange to connect with today's Potters Rd at Wesley Dr. The route followed Potters Rd east to First Colonial Rd, then north on that across US 58 Bus to I-264. At that time, a road went due east and connected with today's "Old Virginia Beach Rd." VA 10-VA 12 followed this until it became 23rd Ave on over tothe waterfront. Today this is broken up by I-264 right by the Great Neck Creek bridge near Birdneck Rd and now requires passing through the parking lot of the Contemporary Art Center of Virginia. In late 1930, VA 12 was extended along VA 10 again (still current VA 337) over to Magnolia, then replaced VA 527 and may have been some new routing to Bowers Hill (used current US 58) and along Airline Blvd to Alexander Corner where it met back up with VA 10. VA 12 followed VA 10 (still using routing through Portsmouth and Norfolk as described above) until the routes reached Battery Ave.
VA 12 continued along Princess Anne Rd (today's VA 166) until it reached Kempsville Rd. VA 12 cut south on this (current VA 165) a brief period then turned northeast through the Norfolk Waterworks on today's VA 165Y. VA 12 continued along today's US 13 (this connection is now cutoff by the I-64/US 13 interchange). Until it reached Shell Rd (at Diamond Springs jct). VA 12 followed Shell Rd to Independence Blvd except the Lake Smith crossing which appears to be US 13's location. VA 12 then followed Pleasure House Rd until it ended at US 60/VA 500 Shore Dr. The part from VA 10 to today's 165Y was new routing; 165Y to US 60 was a replacement for some of VA 502. In Oct 1931 (CTB), VA 12 was placed on Airline Blvd from Alexanders Corner to High St. when it was added to the state highway system. In 1932, VA 12 was extended east along US 60 (replacing the hidden VA 500 duplex) around Cap Henry and Fort Story (used the VA 305 stubs, not the modern US 60) and down Atlantic Avenue. US 60 ended at US 117/VA 10 17th St, but VA 12 continued down Atlantic Avenue across Rudee Inlet to end at the Rifle Range which is now part of Camp Pendleton. South of 31st St was a renumbering of VA 501. 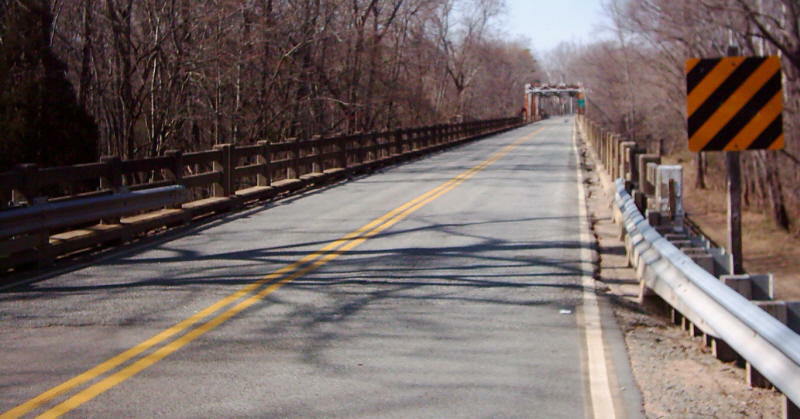 VA 12 did not use any of General Booth Blvd as the bridge was straight and along the shore. It is unclear exactly where VA 12 ended but the initial road to the Rifle Range was assigned as 1.5 miles from VA 10. So the endpoint was perhaps Atlantic Ave S at Croatan Rd. or it may have ended at a gate or continued to Rifle Range Rd (not possible now). Also in 1932, VA 12 was sent through Suffolk using Main St north to today's US 58 Business which was mostly new routing. In July 1933, VA 12 was replaced by US 58 from Suffolk to Norfolk; US 460 from Norfolk out to Chesapeake Beach; US 60 remained around to the Oceanfront and was extended to replace VA 12 to the Rifle Range. The 1926 Official Map has a route log that showed VA 12 to be 413 miles at that time. VA 12 #2: VDOT quickly recycled the number 12 in July 1933. 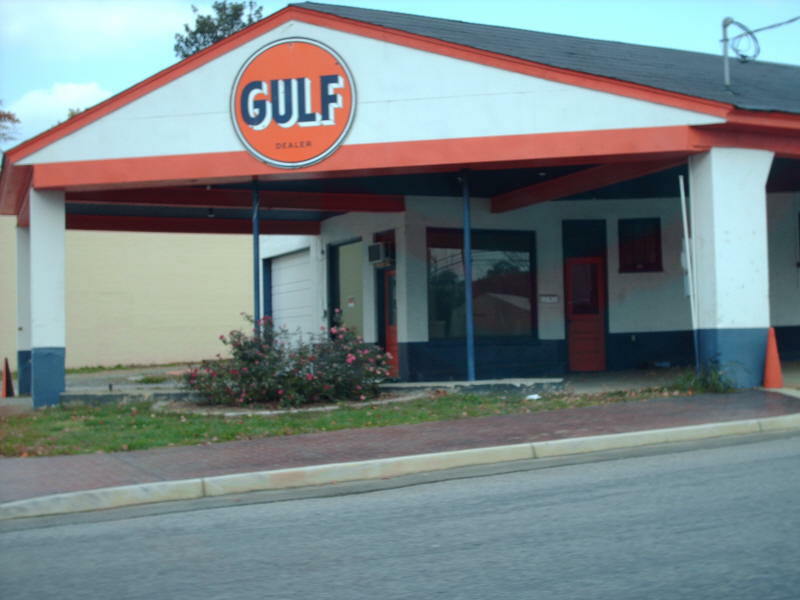 It ran from US 11 Troutville to US 60 Clifton Forge, replacing what had been a part of the original VA 17. 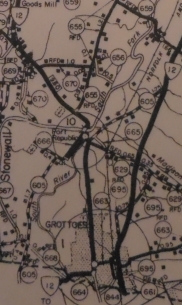 It is unclear if VA 12 used Botetourt SR 655 very briefly or if VA 17 was moved onto the modern alignment first. In Clifton Forge, VA 12 met US 60 at the jct of E. Ridgeway and River Rd, crossed the Jackson River immediately and used Verge St over to current US 220 Business. In Iron Gate, VA 12 used Commerce and 5th St to cut over to Market Ave. In Eagle Rock, VA 12 used today's VA 43 from US 220 down to the SR 870 area where it crossed the James River over to Riverside Dr.
About 1935, VA 12 was placed on upgraded secondary route to connect between Trinity and Daleville, then paired with VA 114 down to US 11 at Cloverdale. The old route from Trinity to Troutville became VA 294 (now SR 670). In July 1935, VA 12 became part of US 220. VA 12 #3: VDOT again ran this number back out in the field in a hurry, in 1936. It began at US 11 near Greenville and ran along today's US 340 to Waynesboro. From there VA 12 followed Wayne St north to Ohio St west to Florence Ave north to either Bridge Ave or Ash St east to Sherwood Ave which turns into SR 865, heading north to Mt. Meridian, then east along today's VA 256 to Grottoes, but VA 12 used Circle Ln to cross the South River onto 4th St. VA 12 then turned north on 4th Avenue (now SR 825 Dogwood Ave) to go to Port Republic. VA 12 did the old zig-zag routing that VA 253 rounds off at the South River, following VA 253 to SR 672 Pineville Rd, which VA 12 used to get to US 33 (now SR 996) near Montevideo. VA 12 duplexed with US 33 east to Elkton, entering town on today's US 33 Business. VA 12 split from US 33 on Spotswood Ave over to current US 340. VA 12 followed today's 340 to Main St, then cut east (this was then a triplex of VA 3-12-55) to Water St north to Manassas St north and east out of town which is today's SR 624 Happy Creek Rd. The VA 55 duplex went out to where the I-66 overpass is nowwhile VA 12 followed SR 624 across the lowbridge of the Shenandoah River. VA 12 followed SR 624 to SR 639 west to SR 658 Rockland Dr. VA 12 went north on SR 658 (which zig-zags) to Stone Bridge, Greenway Court and White Post. VA 12 picked up today's US 340 to Waterloo, then followed the SR loops that lead to Boyce and SR 617 to VA 255. VA 12 followed US 340 to Berryville but used SR 616 to connect with US 340-VA 7 where VA 12 ended. Not long after VA 12 replaced VA 340, it was given today's modern US 340 routing from Front Royal south to Luray, avoiding Browntown Rd entirely (the 1936 Warren County Map shows both alignments). In Sept 1942 (CTB), VA 12 between Front Royal and White Post was rerouted using modern US 340 north to Double Tollgate and US 340 east over to SR 628 White Post (replacing some of VA 277). The old route was demoted to all secondary, which it remains today. About January 1944, VA 12 began using the current US 340 alignment from Waynesboro to Elkton. 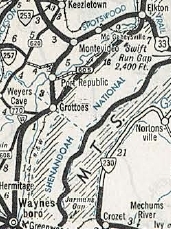 The entire old sections was downgraded to SR 856 (north of Grottoes the SRs have since been renumbered) except a mile or so of VA 256. In March 1953 (CTB), VA 12 was removed from SR 616 Church St in Berryville and also SR 617 Old Chapel Rd/bit of VA 255 and put on current US 340. VA 12 #3 was replaced in its entirety by a very extended US 340 about 1954. VA 12W: Discoverd by NE2 in the January 1923 CTB Minutes as the route from Suffolk south to the NC Line. This was christened as the original VA 103. Today it is part of VA 32 but the northern part of 12W used White Marsh road to get to Suffolk until March 1923 (CTB) where it moved to the current VA 32 corridor. VA 12X #1: Appeared in September 1922 CTB Minutes as the route from Deep Creek south to N.C. By the end of 1923 this became VA 40. Today it is part of US 17 (used the bike path that follows the canal in some places), US 17 Bus, Deep Creek Blvd to Lincoln St to 4th/Court Ave ending at High St. The Oct 1922 CTB typos South Hill for South Mills, giving the illusion of a second VA 12X along today's US 1 corridor but this was not placed into the state highway system until the 1923 numbering system was in place. VA 12Y #1: Appears in CTB Minutes in January and April 1923 as the designation for the route from Franklin to the NC Line. By the end of 1923 this had become VA 121. Today it is part of US 258. VA 12Y #2? : There was a VA 340Y at the US 11-340 junction for a number of years. I do not have explicit proof it was 12Y first. 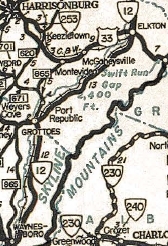 The 1943 VDOT COunty atlas does NOT show a Y connection at that intersection. VA 12Z: Appears in November 1922 CTB minutes as the designation for the route between VA 12 (curr US 58-221) Hillsville and the NC Line below Cana. In 1923 this was renumbered as VA 15. Today this is part of US 52.